Today I'm starting a very exciting challenge. Tia from Iced Lacquer has put this awesome challenge together, look at how cool it is. Thank you Tia for putting this together! 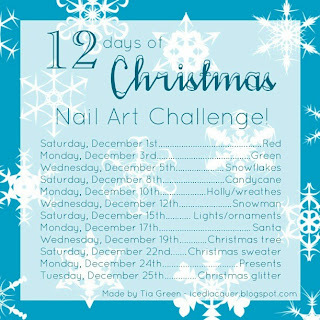 :) This is the first time I participate on someone else's challenge and I'm ready to get started. Aww Lydia, this is brilliant, so well painted! Wow, such fine work for the needles of the chrismastree. I love your work! I love it! I wish I could do freehand art as well as you do it. this is so very pretty :) love it!